Galveston Historical Foundation’s Texas Seaport Museum is seeking hardy volunteers to learn the ropes on board the 1877 iron barque ELISSA and help maintain this National Historic Landmark tall ship. Sail training on ELISSA gives the participants the once in a lifetime chance to sail onboard an historic sailing ship from 1877 and literally, sail history! Don’t think you are a climber? No problem, we have needs for people of all abilities. ELISSA’s sail training is an adventure activity for people of all ages and abilities. Young and older folks alike can find camaraderie and a rewarding experience either in ELISSA’s rigging or on her decks. ELISSA is sailed and lovingly maintained by a dedicated group of volunteers that work and train year round. 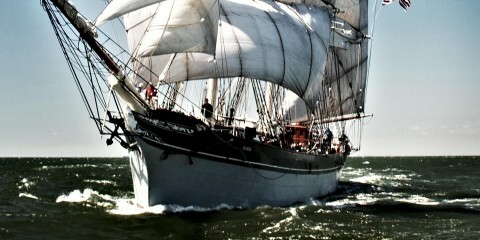 If you have longed to hoist a sail on a historic tall ship, now is your chance. Please join us for an introductory meeting for potential crew members scheduled for 2 pm on Saturday July 27, 2019 at the Texas Seaport Museum on Galveston’s Pier 21, Harborside Drive between 21st and 22nd streets. 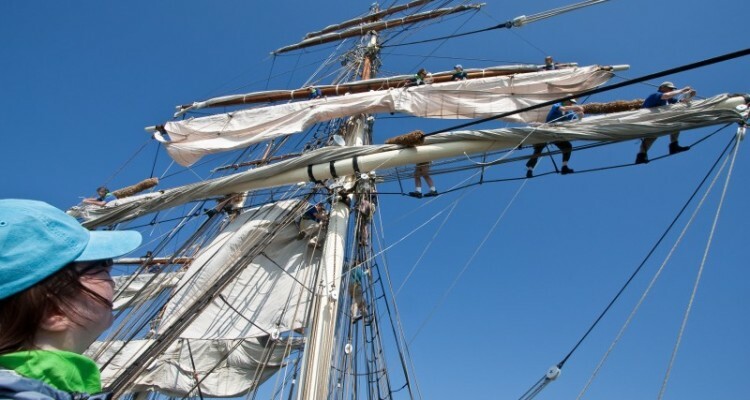 Those who participate in the Seamanship Training Program have the opportunity to learn ancient skills and techniques on maintaining a square-rigged sailing ship. Volunteers may learn to climb ELISSA’s rigging to set and furl sails and maintain the intricate machinery of wood, wire and rope. These tasks require skill and bravery, as the ship’s main mast towers 99 feet above deck. After completing the classes, which take place on designated Saturdays, and contributing the required hours of work on the ship’s upkeep, participants are eligible to take ELISSA to sea. ELISSA was originally a 19th century British cargo ship and specialized in calling at smaller ports of the Caribbean and the Gulf of Mexico and twice loaded cotton at Galveston. It was this local connection, and the authenticity of her iron hull, that led Galveston Historical Foundation (GHF) to purchase the vessel, then a cut-down motorship, and undertake her restoration. Today, ELISSA is one of only three pre-20th century sailing vessels in the world that have been restored to full sailing capacity. Designated by the National Park Service as a National Historic Landmark, ELISSA was named the “Official Tall Ship of Texas” in a resolution signed by Governor Rick Perry in June, 2005. For more information on joining the volunteer crew of ELISSA or to learn more about the campaign to Keep ELISSA Sailing, contact the Texas Seaport Museum at 409-763-1877.